I have had the pleasure of listening to Terry Wise speak at the State House Event sponsored by the Massachusetts Coalition for Suicide Prevention. 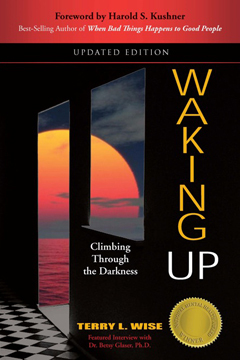 I was tremendously moved by her abilities as an author when I read her book Waking Up: Climbing Through the Darkness, and I am equally as impressed by her abilities as a speaker. Terry’s ability to engage an audience, particularly when talking about difficult subject matter, is amazing. Through her own personal and compelling stories, she is able to put a very human and relatable face to the challenges and suffering so many people experience. She has great stage presence, with a wonderful speaking voice, which helps the overall impact of her presentation. The very articulate way in which she writes also translates into her public speaking. She is able to tailor her speech to the specific aims of the overall program, as she did for us at our suicide prevention awareness event. Terry speaks using moving stories – personal stories – that convey important messages with a decided purpose. As a professional interested in suicide prevention, I’m impressed by her ability to speak to what it feels like to be suicidal and what helped her climb back. The way Terry connects with her audience on both an emotional and intellectual level is a true gift. I hope she has many opportunities to present to a wide range of audiences and organizations, the powerful lessons she can share.